A late edition to the ESRI Developer Summit is the GeoDesign Idea Lab. This is going to be a set of lightning talks by developers showcasing how they’ve been using the concept of GeoDesign in their applications. I’ll be moderating the session with Eric Wittner of ESRI. If you’ve been telling everyone you’ve “been doing GeoDesign for years”, now is you chance to get up and show everyone how your stuff is teh sexay. Most of what we’ve seen out of this GeoDesign has been with researchers and university types talking about concepts. Now is the time to show how developers have been in the trenches integrating disparate disciplines and bringing the results to the decision makers and the public. Email your Lightning Talk (10 minutes maximum) abstract to geodesign_devsum@esri.com to be considered. I’ll be blogging the session in detail so this could be a great opportunity to get your GeoDesign chops out in the open. Plus since it is going on at the same time as the Business Partner Conference expect some of the marketing geeks to drop by and see what is up. T.S. 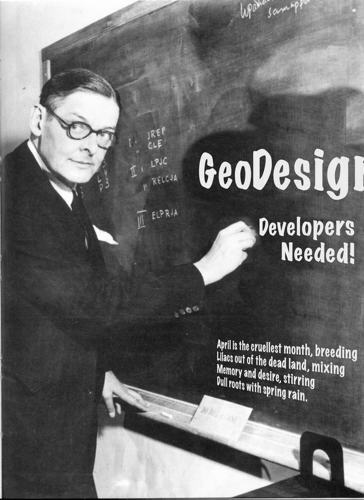 Elliott was doing GeoDesign before anyone else!